Silence Seal: AoE Silence - Enough Said. Mages make sure you have echoes. Melees who wish to keep their Exp should do the same. You can't expect to get a Silena in Einherjar. Cures > Medicine spells for all healers. Danse Macabre: Single target charm. We might get a lol out of this one. If you get charmed - let us know ASAP so we can sleep you. Envoutement: Single-target damage, Chance of Curse. Andhrimnir likes to "warp" around the arena. He often target the person with the most hate. So it's extremely important we fight closely to the boss, to avoid melee having to run around hunting it. 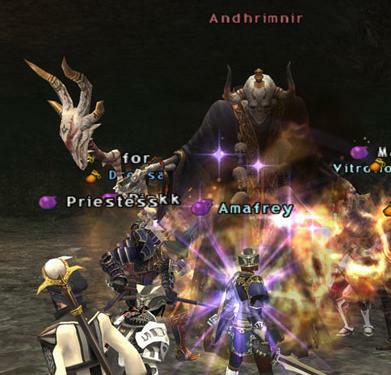 If you are a Summoner sic a pet on the boss fulltime to help tracking him down. Alternatively we will use a BST or /BST for this.